Skin 2 Skin® is Plant Powered, Smart Anti-Aging® skincare with a proprietary “HITS” Technology (Hydrating Infusion Therapy System), and an exclusive formulation of peptides, plant stem cells and vital ingredients. 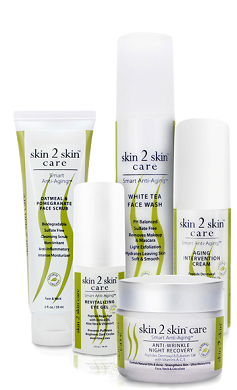 Skin 2 Skin® skincare was scientifically developed to multi-task and revitalizes every skin layer in perfect harmony with all skin types - specifically targeting and aging skin issues at a faster rate, and creating healthy, vibrant and younger looking skin. Skin 2 Skin® Has No Forbidden Ingredients! Including: No Animal Ingredients, No Parabens, No Petrochemicals, No Petroleum, No Mineral Oil, No Lead, No Synthetic Fragrance and Dyes, NO Sulfates, No Chemical Sunscreens, No Formaldehyde, No PEG, No Talc, No Nanoparticles, No Genetically Modified Extracts, No Triclosan, No Phthalates, No 1,4 Dioxane, No Known Toxins and Carcinogens … Your Health and Younger Vibrant Skin is Safe with Skin 2 Skin® natural anti-aging skincare products! Skin 2 Skin Photoaging Repair Cream 1.72 fl oz.